The 1975 duster will blow into Blu-ray's town next month. 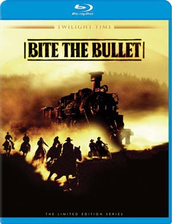 In a recent press release, Twilight Time has slated 'Bite the Bullet' for Blu-ray on March 13. In 'Bite the Bullet' (1975), writer/director Richard Brooks ('The Professionals') gives us a Western on a grand scale, focusing on a 700-mile horse race across the bleakly beautiful landscape of the American Southwest. Entrants battling desert and mountain, freezing cold and blistering heat—not to mention their own inner demons—include a former Rough Rider (Gene Hackman); his old comrade-in-arms, now a gambler (James Coburn); a feisty onetime prostitute (Candice Bergen); a weary saddle tramp (Ben Johnson); a wealthy English toff (Ian Bannen); and an arrogant kid (Jan-Michael Vincent) looking to make his reputation. Featuring a score by the one and only Alex North (available here as an isolated track). The Blu-ray will be limited to 3000 copies and will feature 1080p video, a DTS-HD Master Audio 5.1 soundtrack, and supplements include an isolated score track and liner notes by Julie Kirgo. 'Bite the Bullet' is available here from Screen Archives Entertainment for $34.95. You can find the latest specs for 'Bite the Bullet' linked from our Blu-ray Release Schedule, where it's indexed under March 13.